Earlier in the group, three articles have touched on China Engineers, the engineering giant which played a crucial role in the industrial and commercial development in China and HK since its founding in 1928 and its Eurasian co-founder William CharlesGomersall (1895-1960). After Gomersall’s death, the firm soared to new heights by expanding its distributorship of Caterpillar equipmentand Mitsubishi lifts, establishing various industrial operations across Southeast Asia and acquiring large enterprises such as Harpers and Amoy Canning (see articles) under the ownership and leadership of Yung-Hui Kwong (hereafter referred to as “Y.H. Kwong”) between 1961 when he took over the firm and 1975 when he sold out to the Malaysian conglomerate Sime Darby. A US-trained civil engineer who made his first fortune in Burma (now Myanmar) before fleeing to Hong Kong when his assets were seized by the Burmese military government, Y.H. Kwong was one of the leading businessmen in Asia in the 1960s and 1970s and was named one of the 20 most powerful Chinese businessmen in the world by Fortune magazine in 1971. Born in his native Toishan in Guangdong province in 1908, Kwong was the son of merchant Tak-Gin Kwong and grew up in Stockton, California. He graduated from Stanford in 1929 with a B.A. and from Cornell with a civil engineering degree in 1932 before returning to China in 1936 where he became the manager and executive engineer of an auto parts manufacturer in Nanchang in Kiangsi province. After the outbreak of the Sino-Japanese War, his auto parts factory was destroyed by Japanese bombers in 1938 so he moved to Canton where he became an engineer with the Southwest Transport Administration and was sent to Rangoon (now Yangon) to work on the famous Burma Road, which transported much needed supplies from the outside to the KMT-controlled area. He also worked for the Foo Shing Trading Co, a company under the Chinese Ministry of Finance which handled the collection and export of tung oil to the US and the transport of US military supplies. In 1942, he went into business on his own in Rangoon where he established Jing Hong Trading Corporation (正恆公司).When the War ended in 1945, he immediately flew to the US to reconnect with various suppliers and built Jing Hong into a leading contractor and distributor of automotive and industrial equipment in Burma. After Burma gained independence from the British in 1948, Kwong befriended many important Burmese politicians such as U Nu (1907-1995), the prime minister of Burma from 1948 to 1962 and Edward Michael Law-Yone (1911-1980), the founder and chief editor of The Nation, the most influential English language newspaper at the time and head of various government commissions. In return, he was awarded many important infrastructure contracts – including the building of Burma’s first national communications system and its first airport. Kwong was also big in the distribution of automobiles in Burma and in 1950, he acquired Autocars Burma Ltd, the British owned distributor of Ford Motors vehicles in the country founded in 1920 and was controlled by Wearnes Brothers of Singapore. He also operated Ensign Motors (located at 190-194 Phayre Street in Rangoon, near Jing Hong which was located at 174 Thayre Street) which was the distributor of Standard, Buick, Triump and Fiat from 1948-60 and General Trading & Engineering from 1951-60 in Burma. But Kwong’s business was not limited to Burma, as an article syndicated in US newspapers in 1952 indicated that he was involved in supplying strategic materials to the Chinese Communists while also being close to the US embassy in Rangoon. Kwong amassed a huge fortune during his two decades in Burma and was allegedly the richest man in his adopted country. In 1962, General Ne Win (1910-2002) came to power in a military coup and nationalized all businesses in Burma – including Kwong’s. Kwong’s luxurious mansion in Rangoon was used by Ne Win’s new supreme governing body, the Union Revolutionary Council, for meetings. Even though Kwong lost a lot of his fortune in Burma, he was fortunate enough to have transferred his base to HK where he had acquired China Engineers the year before. And although he had left Burma, he remained close to his contacts from Burma such as S.C. Gaw (吳祥川, 1916-1983), a fellow Burmese Chinese industrialist who served on the board of China Engineers and whose family controls the Pioneer Group in HK. According to the memoir of Wendy Law-Yone, (the first wife of Soong and Marcos family biographer Sterling Seagrave and the daughter of Ed Law-Yone), Kwong was the first major donor of the Parliamentary Democratic Party (PDP), which was formed in 1969 by U Nu and Law-Yone to sponsor armed resistance against Ne Win. (They also met in HK with the Aw family of Tiger Balm fame who started their fortune in Burma for funding but got cold feet). In 1961, Y.H. Kwong became the majority shareholder and chairman of China Engineers. Not only did he take over Gomersall’s shares in the company, he also filled in the void in the technical side left by Gomersall’s demise. Under the leadership of its cofounders W.C. Gomersall and James Hsiung Lee, China Engineers primarily focused on supplying the textile industrythrough the provision of equipment, supplies (e.g. Sandoz dyestuff and US cotton) and financing and also operated several garment and knitting factories. By the early 1960s however, the Shanghainese spinners in HK were less dependent on China Engineers as they have found cheaper financing directly with banks like HSBC (see article on East Sun).Kwong saw bigger opportunities in construction with the real estate and infrastructure boom and in 1962, secured the distributorship of Caterpillar machines and engines in HK for China Engineers. 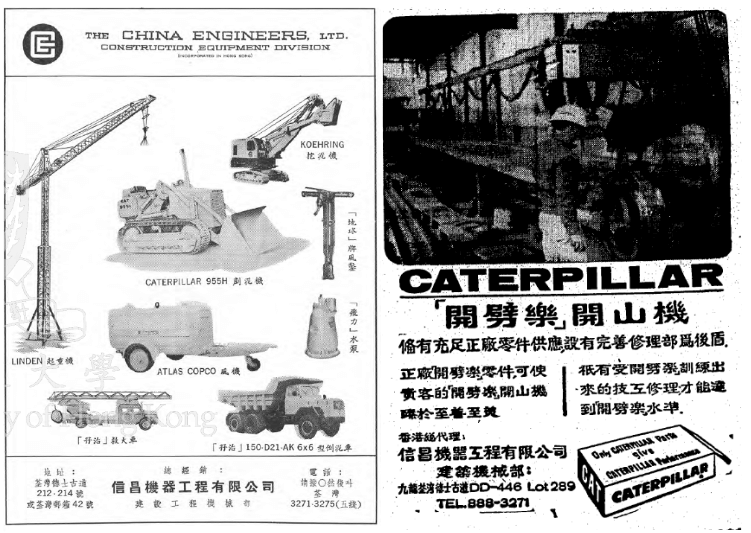 Business was great from the start and in 1965, a 30000 sq ft facility was built on Texaco Road in Tsuen Wan to support the distribution and maintenance of Caterpillar products. Over the past five decades, Caterpillar equipment with the help of China Engineers were used in many major projects in HK such as the High Island Reservoir (largest in HK built in 1972, 70 machines and 50 engines), Cheoy Lee Shipyard (over 500 engines over four decades), Jumbo Floating Restaurant, Kai Tak and later Chek Lap Kok airport (100 machines and 40 engines). The relationship expanded to all of China and by 2012 was doing RMB 5 billion in revenues a year with 2200 dedicated employees. Another key relationship for China Engineers which blossomed under Kwong was the distribution of Mitsubishi lifts. The key figure behind this effort was Fa-Kuang Hu (胡法光, 1924-), the scion of a prominent family of scholars from Wuxi who was trained as an engineer at the Chiao Tung University in Shanghai and the UK and worked for China Merchants and Jardine Engineering before joining China Engineers in 1953 to head up its effort in elevators. Under Hu, China Engineers did good business representing Schlieren elevators (which was installed in buildings such as the Ritz Garden Apartments in North Point) but lost its distributorship when Schlieren was acquired by Jardine’s elevator partner Schindler. To fill in the gap, China Engineers signed with Mitsubishi Electricin 1959 to distribute its elevators and escalators. By 1963, China Engineers had sold over 400 Mitsubishi lifts in HK with important clients such as the new Mandarin Hotel and recurring revenues were generated through after-sales maintenance contracts. In 1966, China Engineers formed Ryoden Electric Engineering Co Ltd (菱電) with Mitsubishi and Hu was given 20% share. The JV went on to win the 396 elevators contract for the Mei Foo Sun Chuen development and extended to other countries such as Malaysia. 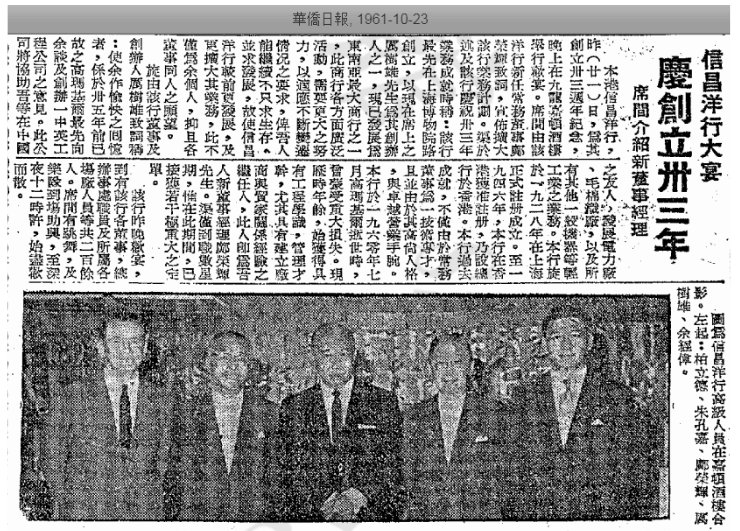 As part of a reorganization in 1970, Hu became the majority shareholder of Ryoden in HK. In addition to Caterpillar, Mitsubishi and textile-related products, China Engineers was distributor of Atlas Copco air compressors, Formica laminates and in 1967 became distributor of Mack trucks in Asia ex Japan. In May 1970, China Engineers Holdings (信昌企業) was incorporated as the holding company and went public through the issuance of 2.25 million shares at HK$7.50 per share. That year, the firm recorded HK$7.11 million in profits, a 40% increase from 1969 on sales of HK$224 million, a 26% increase from the previous year. Part of the proceeds of the IPO were used to finance the construction of a new industrial building in Kwun Tong with total square footage of 543,000, with 40% being used by China Engineers and projected cost of HK$18 million. In the early 1970s, Kwong embarked on an aggressive expansion plan for China Engineers both in terms of geographies and sectors and by 1971, the firm had US$33 million in assets, which aside from its core business of equipment distribution in Southeast Asia and various buildings also included a joint venture with the Japanese in HK to produce miniature radio earphones and electric toy motors, a polyester fibre factory in Thailand, a palm oil extraction plant (Belchinco) with a Belgian partner in Malaysia, two cargo ships anda contracting firm handling major reclamation works in Singapore. As Kwong explained to Fortune – “the reason I lay stress on spreading out in the region is the inherent danger of operating only in one country, particularly for a Chinese. Spread out the way we are, we can survive. A loss in one place would not wipe me out”. In May 1972, Sime Darby, the Malaysian conglomerate founded by two Scottish planters William Sime and Henry Darby in 1910, acquired 37.5% of China Engineers for HK$20.25 million in cash and HK$23.56 million in Sime Darby shares. Later the same month, Sime’s ownership of China Engineers went up to 55% as it injected the 50% of Amoy Canning and 40% of Harpers that it bought shortly before into China Engineers (in addition China Engineers bought 60% of Harpers from Wyllie and the Harper family so effectively China Engineers ended with 100% control of Harpers). For the year 1972, the Group’s profits soared to $19 million and its equity increased to HK$135 million. Then came 1973-74 when things turned south for China Engineers with a combination of macro headwinds (oil crisis, bursting of stock market bubble) and a series of company-specific mishaps (corporate scandal at Sime Darby, losses associated with pharmaceutical business in Nigeria and Singapore reclamation, softness in auto sales at Harpers in HK due to oil crisis and government regulations and rise in costs associated with Amoy Canning). In the six months ending December 1974, China Engineers recorded a loss of HK$41.3 million and the stock sank to HK$1.29 per share, well below its book value of HK$5 per share or NAV of $3.80 per share. In February 25, 1975, Sime Darby acquired Y.H. Kwong’s 3 million shares of China Engineers and increased its ownership of the firm to 74.9%. The same day, Kwong was replaced by Bill Wyllie as chairman of the firm. Outside of China Engineers, Y.H. Kwong controlled other businesses in HK such as T.W. Wu & Co(志衛藥廠), a Western drug maker originally founded in Shanghai in 1938 by former Upjohn representative Tse-Wei Wu. Kwong was chairman of T.W. Wu & Co (HK) Ltd which was incorporated in 1958 and dissolved in 1981.He founded Intercontinent Finance Corporation in 1946 (incorporated in 1964 and dissolved in 2002) and Intercontinent Development Corporation (incorporated in 1964 and dissolved in 1999). He was also a founding director of Hong Kong International Securities (the precursor of Nomura Securities HK), which was started in 1961 by S.C. Gawin partnership with Japanese securities giant Nomura and a group of other businessmen such as the Japanese Chinese financier Tsai Ming-yu (founder of JCG Finance), shipping tycoon Frank Tsao and the rice magnate Chan Wai-shun. He visited Shanghai for the first time in 30 years in 1979 and in the 1980s, he became the Southeast Asian franchisee of Hobson’s Ice Cream after trying the premium ice cream brand on a business trip to Tokyo. In April 1992, Y.H. Kwong died at the age of 84. He was survived by his wife Jean Woon-Gin Leung (梁煥珍,native of San Antonio, Texas and sister of Naomi Li of Chekiang First Bank)whom he married in 1938,two sons – Hsueh-ChuanKwong and Chun-ChuanKwong (鄺君泉, “C.C.”) and three daughters – Wei-June, Wei-ling and Wei-ching. Hsueh-Chuan was married to Pamela Pak (Peck) Wan-kam (白韻琴), who later became a famous radio talk show host and columnist in HK. C.C., who received his S.B. 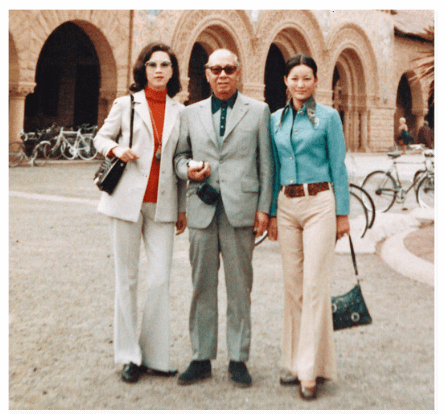 from MIT and MBA from Columbia, built his career in private banking and established the HK office of Swiss private banks Ferrier Lullin and La Roche & Co.
YH Kwong re-visiting his alma mater Stanford with his secretary Linda Chuang (莊永楚) and his daughter in law Pamela Peck. New York Times, 3 Dec 1989: A.74. This article was first posted on 4th February 2019.